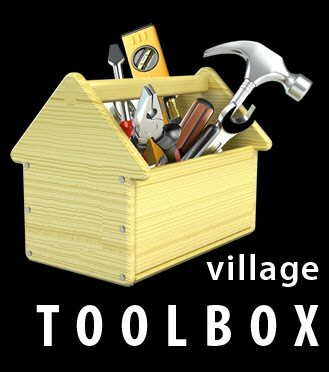 It seems as though village building season is officially upon us... 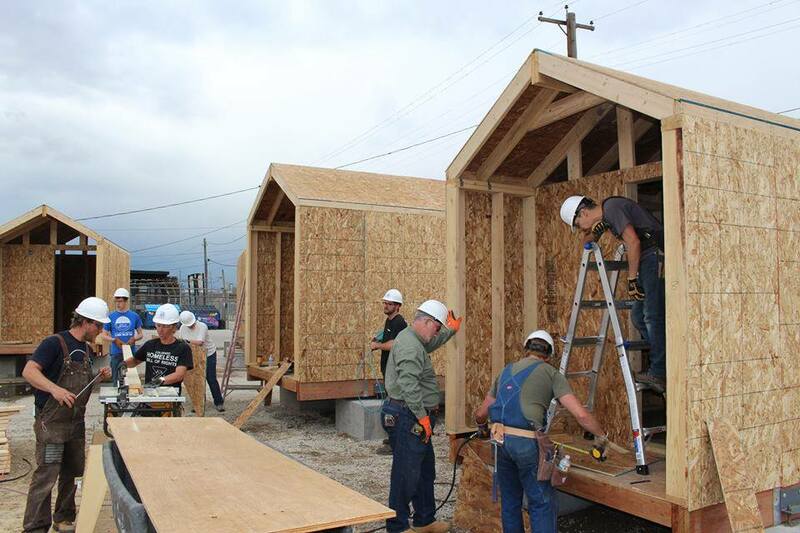 In the first week of June, four tiny house communities were under construction in four different cities! At Emerald Village here in Eugene we are a month into site development. The site has been cleared, building foundations excavated, and much of the utility infrastructure has been installed. Because we are running sewer, water, and electric to 24 different tiny houses on permanent foundations, it's a pretty involved process. And we won't begin erecting the tiny homes until mid July. But three other projects have tiny homes going up right now, which I wanted to briefly showcase here. I think they each capture one of the most attractive aspects of the village model—it's at a scale that a lot of different people can engage in. Today was a dream come true for all of us who have been eagerly awaiting the weather to allow us to build. 6 1/2 months have passed since we got approval from the Medford Oregon City Council to lease the little triangle across from the Medford City Service Center. Winter stalled our development and we were anxiously awaiting dry weather to prepare the site. Today there was overwhelming community support for our Big Build Day. We put a call out for 75 volunteers.... over 180 people showed up and many others didn't even sign in. Thank you to all the project leaders and volunteers for making this day such a huge success. There are a few little details to finish tomorrow. 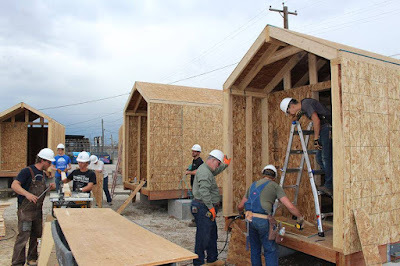 but for the most part we have 14 tiny house kits built IN ONE DAY!! We would especially like to thank our project managers Jim Keeter and Roy Striley for their tireless efforts and our volunteer coordinators David and Sharie Beale and to Kelly Anderson for placing the volunteer opportunity onto JustServe. All in all this is a huge day in the history of Hope Village. Thank you all for your love, encouragement and support. As part of Village Building Convergence 2017, join Kenton Neighborhood, City Repair, PSU's Center for Public Interest Design, and friends as we work on the site of Portland's first sleeping pod village! We will be building berms, planters, stairs, and a fence (description of tasks below). The site is located on the lot just north of Kenton Park on Argyle St.
1) Berm: Building a berm to bring additional green space and community space into the Kenton Women's Village. Activities will include: moving and lifting timber and/or concrete; using soil to construct the berm; laying sod; placing trees in the village. 2) Planters: Building portable planters made from wood pallets and dimensional lumber. 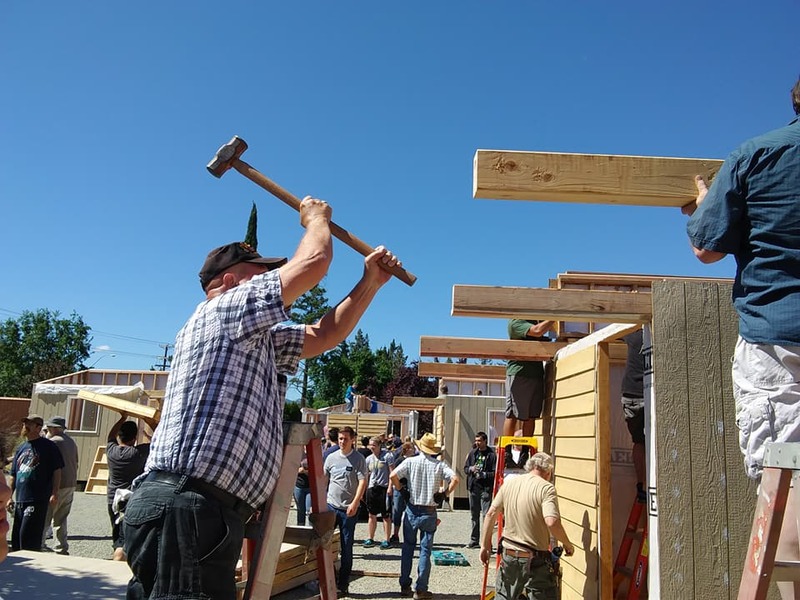 Activities will include: cutting, lifting, and drilling lumber; filling planters with soil; planting fruits, vegetables, and trees; and moving built planters around the site. 3) Stairs: Building stairs from dimensional lumber that lead from street level to a public gathering space. Activities will include: excavating soil; cleaning the area of debris; cutting, lifting, and drilling lumber; and possibly planting in the hillside. 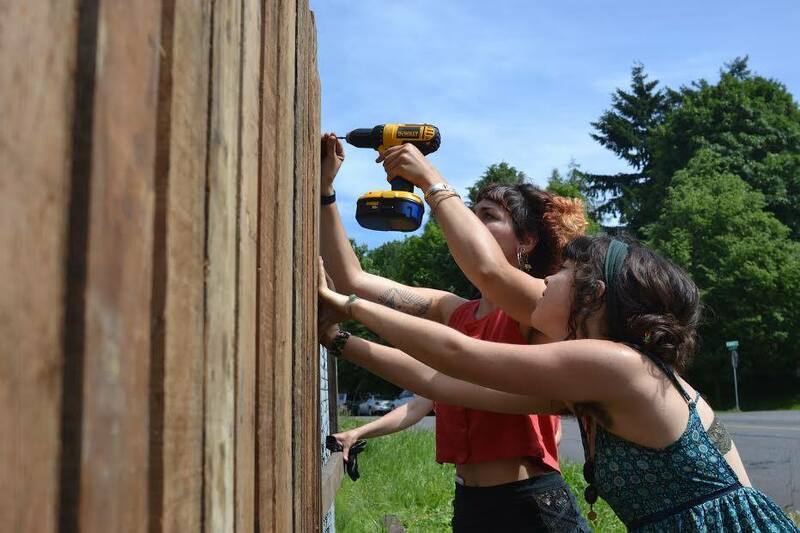 4) Fence: Creating an installation of horizontal or vertical wooden slats that will overlay the existing chain link fence. Activities will include: cutting and lifting dimensional lumber; securing hardware to the slats; and arranging the components in a pattern. After 7 days of building we have 11 homes framed, sheeted, roofs on, and a bathhouse almost done! But we still need to insulate, roof, side, and paint... and these are jobs we can use your help with! We will be working May 31-June 3 and June 5-10 from 8am-5pm. If you can join us in this work any of these days that would be great! There is always coffee, snacks, and lunch served.